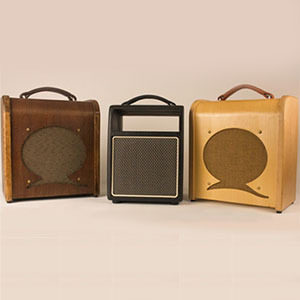 For this month’s case study we take a glimpse into the rock and roll world of Robert Becker, chief operations officer at Quilter Laboratories, an American guitar amplifier company located in sunny Southern California. Quilter Labs make a variety of amplifier models, from small heads to combo amps, all with the help of Vcarve Pro. Robert’s use of vcarve to both prototype and then create the manufacturers cutting files with vcarve is a good way to save time and help ensure they get exactly what they want. This impressive use of the software is not the only thing that they have been using vcarve for though, recently he completed a project to restore an optigan for a famous musician. If you’re not sure what an optigan is, neither were we! Thankfully Robert was able to explain that. 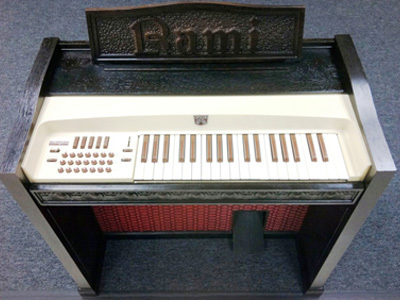 The optigan is a quirky keyboard instrument that uses “program discs” containing recorded sounds. It was the brainchild of the toy company Mattel which sold thousands of them in the early 1970s. Robert owns and services a few of these himself, so he’s pretty knowledgeable on this unique instrument. Since 2008 Robert has been working with Pea Hicks of optigan.com to make program discs for optigan enthusiasts. If you want to learn more about the optigan take a look at their website http://optigan.com/ for a wealth of additional information. "We now generate all of the toolpaths for mass production with vcarve Pro. 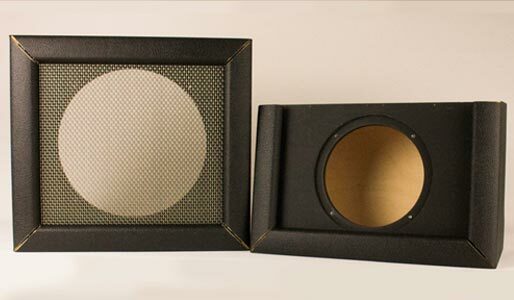 These are then sent over to our supplier who uses them to cut out the parts we need for our Amp cabinets on their industrial CNC router"
“In 2013 Quilter Labs was invited to attend a special live-streaming event from Rami Jaffee’s studio. Rami Jaffee is the keyboardist of the Wallflowers and plays with the Foo Fighters; he’s a friend of our guitar amp company, Quilter Labs. While there I surveyed the vintage equipment and discovered an optigan in a sad state of repair. As a goodwill gesture, I offered to restore it for him. The repairs to the electronics and mechanism were of the usual sort for these instruments, but the original plastic music stand was missing. His particular optigan model, the Mediterranean, is a dark brown color and made of temperite (a moulded plastic material). The cabinet style might be described as Conquistador-Modern. So I selected a dark walnut for the music stand to match the existing cabinet. I have the same Optigan model with an intact music stand, so I took measurements. I made a 3D model in solidworks, and exported a file to vcarve Pro. I added the letters for Rami’s name in vcarve Pro. 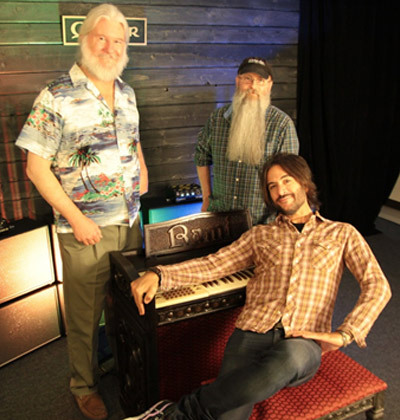 Click here to watch the video of Rami Jaffee testing out the restored Optigan with Robert and Pat Quilter (one of the founders of Quilter Labs). It appears that Rami was over the moon with the customisation that Robert had created for him! You can also see the three of them in the image to the right. We’re excited about the idea that this instrument could see a new lease of life in the future. Along with that and the future work he has lined up creating more amp concepts ready for production it’s safe to say we think that Robert Becker has a pretty cool job combining beautiful design work with CNC technology to make incredible musical instruments and cabinets. We’d like to say a really big thanks to Robert for getting in touch to tell us about this very interesting, novel use of the software and providing images and links to the video. On top of that we got to learn about the optigan, there are more than a few of us at Vectric who would like one for recreational area in our new office when we move in!